Knowledgeable fans of high school girls hockey knew getting matched up with Fonbonne Academy was a tough draw for the Vineyarders. Fontbonne is a perennial power house, having won the state championship in 2010, and having been runners up at the Boston Garden in 2011 - each year they begin their season with a goal of winning a state championship. While Martha's Vineyard was coming off a wonderful regular season that saw them win 12 games and qualify for post season play for the fourth consecutive year, no one would mistake the pedigree of each program. However, after 45-minutes of truly spirited play from the Vineyarders that saw Martha's Vineyard in a tie hockey game late in the third period, a message thad been sent to Fontbonne Academy and other perennial power houses, that Martha's Vineyard could play with some of the best in the state. The visiting Ducks with their speed, strength and experience dominated the first period. Martha's Vineyard was prepared to play much of the period in their own zone, and they protected the front of the net in front of Jackie Hegarty. The junior net minder played the best period of her career and allowed only one shot to sneak past her, and the Vineyarders survived the opening 15 minutes only down 1-0. Martha's Vineyard used their veteran leadership to stay the course in the second period. Block shots, allow nothing in the middle of the ice, and wait for a chance at the offensive end was their motto. The Vineyard chance would come before the five-minute mark. Kylie Hatt pinched in at the right point, and let go a wrister that found its way behind the Fontbonne goalie to tie things at 1-1. All the Vineyard wanted was a chance, and they had earned their chance heading into the final period. All of a sudden it was Fontbonne who looked like the underdog at times in the last period. The Vineyard was limiting almost all of the Ducks offensive chances, and Sydney Davies made several glorious moves to free herself for a breakaway with less than six minutes to go in the game. She was pulled down, and the Vineyard was all of a sudden on the power play. Unfortunately for the home team, that's when the underdog story hit the reality of playing a tournament tested power. Fontbonne quickly drew a MV penalty, and the Ducks found the back of the net for the go-ahead goal with just over five minutes left in the game. Despite another Vineyard breakaway opportunity after the goal, Fontbonne was able to score again less than a minute later, and the dream was over for the plucky group of Vineyarders. The entire team could hold their heads high when they left Martha's Vineyard Arena to the cheers of the parents and fans who paid homage to their effort. All seven seniors played in the state tournament game, and each had meaningful shifts in the game, the season and their careers. They leave a legacy of 47 wins over their four years, and an understanding that they were instrumental in putting Martha's Vineyard Girls Hockey on the state tournament map. Martha's Vineyard capped a wonderful season, with arguably their best win yet, a 3-2 decision over the first place Marshfield Rams on Senior Day at Martha's Vineyard Arena. The Vineyarders entered the third period up by a goal on their league rival, with memories of a heartbreaking loss less than two weeks earlier still running through their heads. This time, though, the team showed their resilience and protected the one goal lead. As the buzzer sounded, and a late Marshfield goal was waived off, the Vineyarders celebrated the careers of seven seniors, and a season that saw them post an impressive 12-5-3 record. Aubrey Ashmun scored two first period goals to post the Vineyard to an early 2-0 lead. A Ram goal late in the opening frame cut the Martha's Vineyard lead in half, but Sydney Davies lit the lamp early in the second to regain the Martha's Vineyard two goal lead. Marshfield tallied late, and the scene was set for a dramatic final period. The Rams outshot the Vineyard 12-3 in the final stanza, controlled the play, and desperately tried to get the equalizer. However, all seven seniors saw the ice in the final period, and all the underclassmen contributed in front of a stellar Jackie Hegarty. The final horn sounded, and Martha's Vineyard celebrated their dramatic win over the visiting Rams. Two goals from Aubrey Ashmun, and single tallies from Belle Dinning and Erin Hegarty, paced the Vineyard to a their third win a row Saturday at Martha's Vineyard Arena. After dominating a scoreless first period, Ashmun scored twice in the second. A late DY goal cut the Vineyard lead to one going into the final period, but Hegarty and Dinning put things out of reach. With the win, Martha's Vineyard moves to 10-5-3 on the season (6-3-3- in the SEMGHL). A Monday home game with Nauset is next on the docket, as the Vineyarders look to improve their tournament seeding in the last week of the regular season. The Vineyarders punched their ticket to the MIAA state tournament for the fourth consecutive year with a 5-1 win over league rival Bourne. All four-year seniors scored a goal, and Martha's Vineyard battled back from a 1-0 deficit to win on the road and raise their record to 9-5-3. Aubrey Ashmun (two goals), Sydney Davies, Erin Hegarty and Olivia Ogden all tallied to lead their team to victory. The four have never been shutout of post season play, and they have now been a part of 44 team victories during their years in the program. Martha's Vineyard has three games left in the regular season and all will take place on home ice. Saturday the Vineyard hosts Dennis Yarmouth, Monday Nauset, and Thursday is senior day against Marshfield. Late game heroics from the line of Belle Dinning, Sydney Davies and Aubrey Ashmun helped pull out a win in dramatic fashion on Tuesday. A defensive zone face-off won by Dinning and Davies sent Ashmun in on a breakaway, and the senior made a nifty move with 1:12 left in the contest to give Martha's Vineyard their first lead of the afternoon. Less than 20 seconds later, Ashmun scored again to seal the win, and the Vineyarders escaped with a 3-1 victory. Martha's Vineyard was clearly still smarting from their tough loss on Saturday, and their play in the first period was uneven. The Vineyarders spotted the visiting Spartans the first goal of the afternoon with just over six minutes left in the period. Despite a decided shot advantage and a tiring goal early in the second period, the Vineyard still found themselves in a tie game as the clock ticked down. The late game heroics lifted the home team's record to 8-5-3, and Martha's Vineyard needs just one point to qualify for post season play for the fourth consecutive season. Sometimes sports can be cruel. After playing 42 complete minutes of hockey, and on the verge of stealing a win at division leading Marshfield (13-3-0), Martha's Vineyard allowed two goals in the last three minutes to drop a 3-2 decision. A Marshfield goal just 55-seconds into the contest sent alarm bells through the Vineyard contingent, but the visitors rebounded with strong play in all three zones. Senior wing Sydney Davies got her team even when she finished off a feed from lineman Aubrey Ashmun late in the second period. A power play goal from Davies early in the third put the Vineyard up 2-1, and hope for an upset was becoming closer to a reality. However, a suspect call by an on ice official put the Rams on the power play late in the final period, and Marshfield was able to capitalize with a power play goal with less than three minutes to go in the contest.. With the Vineyard now hoping to steal a road point, Marshfield finished an end-to-end rush 33-seconds left in the game to take the lead and break the Vineyard hearts. With five regular season games remaining, Martha's Vineyard looks to build off the positive effort, and not let frustration seep in, when they take to home ice Tuesday against Bishop Stang. The Vineyarders exploded for three goals in the second period top erase a 1-0 deficit en route to a 5-3 non league victory at Franklin. With the win, Martha's Vineyard improved to 7-4-3 on the season, and they creeped within three points of a post season berth. Junior Meg Burke set up Aubrey Ashmun to tie the game early in the second, and subsequent goals from Sydney Davies and Belle Dinning posted the Vineyarders to the two-goal lead. The two teams traded goals in the third, before the Vineyard clinched the road win. Martha's Vineyard travels to Marshfield on Saturday for a league showdown with the first place Marshfield Rams. After falling behind 1-0 early in the first period, Aubrey Ashmun helped lead the Vineyard back mid way through the period. A pass to Kylie Hatt set up a Hatt writer from the point that Sydney Davies was able to redirect into the BMW net. Then Ashmun roofed a backhander in close to give the Vineyard the one-goal lead. The points were numbers 99 and 100 for Ashmun's career, and she became the first Vineyard female hockey player to reach the exclusive milestone. A back and forth contest ensued, and Martha's Vineyard and BMW traded quality scoring opportunities. BMW finally got the equalizer half way through the final period, and the two teams finished the league contest deadlocked at 2-2. Martha's Vineyard earned a point on the afternoon, and they still need three to qualify for post season play. The Vineyarders travel to Franklin less than 24 hours later for a non league tilt with the Panthers. The Vineyard played quite possibly their most complete game of the season, but it was not enough to top Katie Holmes and her King Philip teammates. The 8th grader, one of the top players in the state, tallied a goal and an assist half way through the middle period to lead the undefeated Warriors (12-0-3) to a 2-0 victory in Foxboro. Martha's Vineyard played a spirited first period, and carried a majority of the play, holding King Philip without a shot over the opening fifteen minutes. The middle period had some of the same feel, but Holmes broke down the Vineyard on a wonderful individual rush, and KP took a 1-0 lead. Just 20 seconds later, Holmes made a beautiful pass from the corner, and KP was up 2-0. Towards the end of the period and early in the third, the Vineyard had a couple of glorious chances, but senior Molly Potts turned back all Vineyard efforts. Martha's Vineyard left Foxboro with their heads held high. They outshot KP 17-11 for the contest, and the team from goalie out all played with confidence. The Vineyard gets right back at it on Monday when they host league rival BMW. Martha's Vineyard used stifling team defense, timely offense, and a strong work ethic to defeat Quincy/North Quincy to capture the program's first Nan Rheault Tournament title. After beating perennial rival Scituate with an offensive explosion in the tournament opener, the Vineyard clamped down on defense in the finale. Kiara Vought and Belle Dinning set up Sydney Davies 2:40 into the contest, and that goal would prove to be all the Vineyard would need on the afternoon. Despite many chances to make it a two goal cushion, Martha's Vineyard would not let nerves get in the way of preserving the victory. Goaltender Jackie Hegarty came up with many big saves to earn the shutout. Two four-year senior defensemen, Olivia Ogden and Erin Hegarty were instrumental in helping Jackie on the back end. Aubrey Ashmun and Davies were also strong on both ends of the ice as they competed in their fourth Nan Rheault. Vought, Megan Hurley and Katrina Lakis all celebrated the victory in their last tournament appearance. Seven different Vineyarders found the back of the net, and Martha's Vineyard exploded in the first round of the 14th annual Nan Rheault tournament against their arch-rivals from Scituate. With the victory, Martha's Vineyard will play in the championship game for the first time in four years when they host Quincy/North Quincy Sunday at 1pm. Julia Levesque got the scoring going less than two minutes into the contest, and Sydney Davies (two goals), Belle Dinning, and Aubrey Ashmun lit the lamp to race the home team to a 5-0 lead after one period of play. Scituate scored early in the second, but Ashmun finished a breakaway with four seconds left in the middle stanza to keep the five goal cushion. Scituate star Corey Murray scored twice in the third, but Kylie Hatt, Ashmun, and Katrina Lakis's first varsity goal kept the Vineyard offense pumping. Jackie Hegarty was strong in net, and Martha's Vineyard celebrated briefly knowing a big opportunity awaits in Sunday's championship game. The Vineyard couldn't capitalize on a strong first period, and the visitors from Sandwich took advantage with a four goal second period to send the home team to defeat 5-2. Martha's Vineyard dominated the first period with strong team play in all three zones. Sydney Davies scored the period's lone goal, and the Vineyarders headed to the intermission up 1-0. The second frame was a polar opposite display of hockey from both teams Numerous Vineyard miscues led to a Sandwich comeback, and the home team found themselves in a 4-1 hole. An even third period was not enough to get Martha's Vineyard back in the game, and despite a hard working goal by Kiara Vought, the Vineyard dropped a 5-2 decision to fall to 4-3-2 on the year. 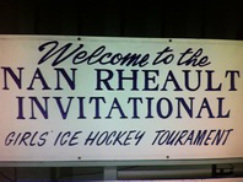 Next up is the annual Nan Rheault tournament. Martha's Vineyard welcomes Scituate, Peabody and Quincy to town, and the Vineyarders open the festivities with a 7pm showdown on Saturday with Scituate. Seniors Aubrey Ashmun and Sydney Davies led the Vineyard to a 5-3 victory over a pesky Bishop Stang squad. Ashmun netted four goals and Davies added four assists to help pace Martha's Vineyard to their fourth win of the season (4-2-2). Belle Dinning got the Vineyard on the scoreboard first with a nice writer over the shoulder of the Spartan net minder. Stang answered before the end of the opening period with a power play goal, and the teams were tied 1-1 after the first 15 minutes. Ashmun scored her first two goals of the afternoon early in the second, and despite a lopsided MV shot advantage, Stang was able to keep within striking distance with another power play goal towards the end of the middle stanza. Ashmun tallied early in the third for her hat trick and -- after a fluke Stang goal -- finished the game's scoring late in the period to give the Vineyard the SEMGHL victory. The team returns to action for a rare Wednesday home game when perennial power Sandwich comes to town. The Vineyard controlled play from start to finish in their 8-1 rod win at Charles Moore Arena in Orleans. Six different purple players found the back of net, and Julia Bettencourt got the win in net as Martha's Vineyard raised their record to 3-2-2. Senior Meg Hurley got Martha's Vineyard on the scoreboard first with a little less than four minutes left in the opening period. Kylie Hatt 's wrister from the point on the ensuing shift gave Martha's Vineyard a 2-0 lead, and the road team never looked back. Four goals within 2:29 early in the second period put things out of reach for the Vineyard. Erin Hegarty, Belle Dinning, Sydney Davies and Aubrey Ashmun all joined the goal barrage. Hegarty and Dinning added third period tallies, and Martha's Vineyard left the Cape SEMGHL victors. Martha's Vineyard traveled to Plymouth to take on North and South two weeks after sneaking out of Martha's Vineyard Arena with a 1-1 tie. Jackie Hegarty and the Vineyard defense had a wonderful first two periods, holding the high flying unified team to one goal, but the Vineyard ran out of steam late, and dropped a 5-0 league game. Trailing 1-0, and badly outshot after 30 minutes, the Vineyard played perhaps their best hockey of the season early in the final period. Several quality Martha's Vineyard opportunities were stopped, though, and just under six minutes gone in the period Plymouth was able to get their second goal of the game. On the ensuing shift the Vineyard was stoned on a breakaway, and a mad scramble in front of the net somehow resulted in a Martha's Vineyard penalty. Plymouth scored a power play goal, and added two more power play tallies in the last two minutes to give the home team a 5-0 victory. Martha's Vineyard plays two more on the road in the upcoming days ahead. League games with Nauset and Bishop Stang will test the Vineyard mettle as they look to get back on track in 2015. Martha's Vineyard wasted little time getting rid of the bad taste from their Pembroke performance, as the Vineyarders used a three goal performance from Sydney Davies to defeat their rivals from the Cape. Davies put the Vineyard up 1-0 half way through the first period when she buried a loose puck in the slot for her first goal of the season. Aubrey Ashmun tallied on the first shift of the second period, and Davies blew by two DY defenders minutes later to increase the Vineyard lead to 3-0. A Dolphin goal late in the middle period cut the Vineyard lead to two, but Davies completed her hat trick early in the third to put the game out of reach. Sophomore goalie Julia Bettencourt won her first game of the season (1-0-1), while Kiara Vought chipped in two assists to help Martha's Vineyard to the league win. Martha's Vineyard goes into the New Year at 2-1-2 on the season. Their SEMGHL record stands at 1-12, and the team returns to the ice at Plymouth on Saturday. doldrums in a dramatic way. A five goal second period broke open a tight game, and propelled Pembroke to the commanding league victory at Martha's Vineyard Arena. Despite a nearly even shot total in the first, Martha's Vineyard found themselves in a 2-0 hole. The second period started on an ominous note when the puck stuck in a puddle left by the zamboni on the Vineyard doorstep, and Pembroke's Shea Coady knocked it home to give Pembroke a 3-0 lead. The final stages of the middle stanza were a nightmare for the home team, as they watched Pembroke add four goals over a three minute stretch to put the game out of reach. A good third period saw the Vineyard's Aubrey Ashmun and Belle Dinning find the back of the Pembroke net, breaking a five period scoring drought against the Vineyard's new SEMGHL partner. Martha's Vineyard hopes to carry the third period momentum into their next tilt on the road against perennial rival Dennis-Yarmouth. Another new league game against a new league team, and another dramatic tie. Martha's Vineyard battled the combined schools of Plymouth North and Plymouth South to a 1-1 draw on Saturday, and the Vineyarders head into the Holiday break 1-0-2 on the young season. Sophomore goaltender Julia Bettencourt followed junior counterpart Jackie Hegarty's strong performance against Pembroke with a gem of her own. Bettencourt stopped 20 Plymouth shots and kept the Vineyard in the game to the end. Like Wednesday's contest, this one was scoreless after two periods of play. Plymouth broke the deadlock just over a minute into the final stanza, but Martha's Vineyard would not be deterred. Sydney Davies and Aubrey Ashmun combined to get the puck into the Plymouth zone on the ensuing face-off, and sophomore defenseman Kylie Hatt roofed a wrister over the Plymouth net minder just 13-seconds after the Plymouth tally. The two teams battled to a draw the rest of the way, and Martha's Vineyard felt relieved to get the point in league standings. After the break things don't get any easier for the Vineyard. The team returns to action at home against the aforementioned Pembroke squad, and then travels for two more tough league contests at DY and Plymouth. Paced by the strong play of Vineyard goalie Jackie Hegarty and good work in the defensive end, Martha's Vineyard held their own in the team's first road contest of the young season. Pembroke, a new SEMGHL rival, entered the contest riding high after their opening day 3-0 win at Denis Yarmouth. The Vineyard too entered on an up note after their 3-2 win, but nervous with the expectation of playing a talented newcomer. Hegarty's play early helped the Vineyard to gain some confidence, and the team battled evenly with the hosts in all three zones. Several quality scoring chances at both ends were turned aside by both goaltenders. Hegarty finished with 22 saves, and the Vineyard could not find the back of the Pembroke net with 22 of their own shots. Hegarty's shutout was the first of her career, and her team now gets ready for an afternoon contest with Plymouth on Saturday at home. The Vineyard opened their 2014-2015 campaign with a 3-2 victory in non league action at the Martha's Vineyard Arena Saturday night. After the home team was able to strike early and command play for much of the first period, a late tally by Brookline to end the first period, and an early second period goal put the Vineyard on their heels. Martha's Vineyard was able to answer, though, with a an Aubrey Ashmun goal towards the end of the middle period, and a final tally from Ashmun 2:32 into the final frame to get the lead and momentum back. Senior Kiara Vought opened the scoring for the Vineyard before the five minute mark of the opening stanza. Martha's Vineyard was tenacious early, but couldn't up their lead, and Brookline converted with just 1.7 seconds left in the first. The Vineyard were still smarting from the late first period tally when they began the second period, and Brookline scored again to go up 2-1. Martha's Vineyard was able to settle down, however, and they regained their earlier play that created multiple scoring opportunities. Ashmun's two tallies, strong play from Olivia Ogden, Erin Hegarty and Kylie Hatt on the back end, and clutch saves from junior net minder Jackie Hegarty all helped the Vineyard hold on for their first win of the season. Next up for Martha's Vineyard is a trip to Bridgewater on Wednesday to take on Pembroke High School. Pembroke is a new SEMGHL team this season after breaking away from their co op with Whitman Hanson. They proved they will be a team to reckon with this season with their 3-0 opening day win at Dennis-Yarmouth.